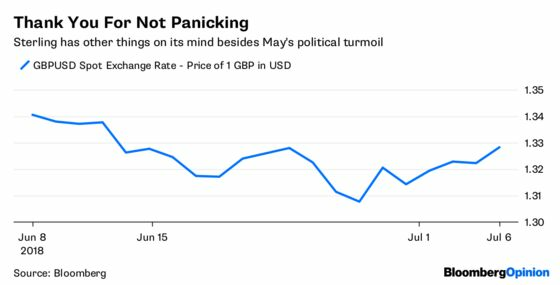 (Bloomberg Opinion) -- You’d hardly know there was a U.K. political crisis going by looking at the pound. Prime Minister Theresa May’s Brexit plan was so distasteful to one of her leading cabinet ministers that he quit — surely that is a recipe for the currency to tank. And yet, sterling managed to climb to its highest in almost a month versus the dollar. This makes sense for a number of reasons. To start, much of the move is down to weakness in the dollar. 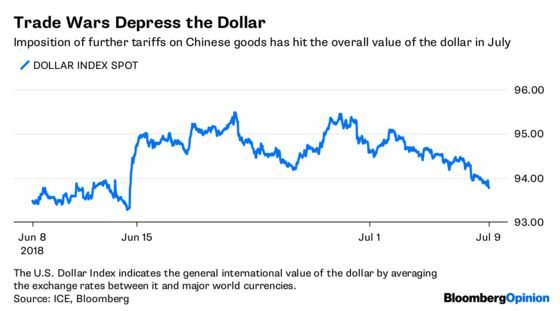 President Donald Trump’s trade war, which came into effect on Friday, has hammered the greenback against all major currencies. And sterling remains trapped in a very tight range versus the euro. At present, domestic politics are not driving the currency. Of course, the dollar isn’t the whole story. Underpinning the pound is the growing likelihood that the Bank of England will raise rates at its next policy meeting, on Aug 2. Governor Mark Carney’s statement that he’s “serene” that the Monetary Policy Committee will have sufficient economic data to make a decision on rates is a strong signal that officials believe the economy is robust enough to warrant tighter policy. Investors now place an 80 percent probability on a quarter-point rise to 0.75 percent. The relative calm in the currency to the political turmoil also shows investors are giving more weight to May having secured the agreement of much of her cabinet to her soft-Brexit proposal. The resignation of just one cabinet minister doesn’t matter quite so much. The minister in question, David Davis, was at most nominally in charge of the whole withdrawal process, and he is the egg that needed to be broken to make this omelet. Sterling is looking through the domestic uncertainties at the moment. May has a tough day ahead. If the remaining cabinet unity holds, and she puts in a convincing performance Monday at a meeting of all conservative members of parliament, then a softer Brexit becomes ever more likely. In the end cabinet unity, with collective responsibility restored, trumps the exit of one cabinet minister who had been effectively sidelined anyway. May could wind up stronger from all of this, yet it could still all go horribly wrong. The EU have yet to even offer an opinion on her proposal. That’s all part of the Westminster bubble. Currency traders have a whole world of trouble to consider. The sell-off in gilts today suggests that the currency and bond market are at odds. But actually, for the latter, technical factors are more important. The weakness on Monday reflected investors’ preparation for syndicated supply of 5 to 6 billion pounds of a new 2041 inflation-linked security on Wednesday. In fact, there’s a lot of fixed-income weakness about — Treasury yields are also up due to a heavy supply calendar. 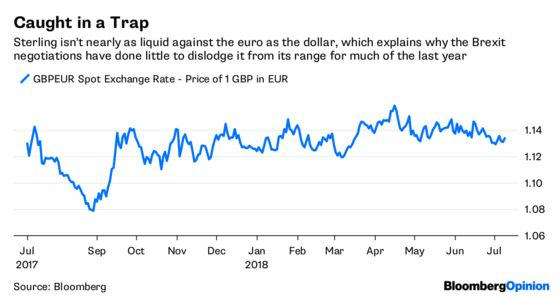 Unless expectations for a softer Brexit meaningfully change, or the Bank of England signals it won’t raise rates, then sterling’s value against the dollar is more subject to the vagaries of Trump’s trade wars than domestic events. The dollar remains the the main driver of the currency pair, Brexit or not.